Paige Thomson ’16 shares guest blog posts about her study abroad experience in Italy during the spring 2014 semester. More about Paige: I’m a business major with a double concentration in finance and financial planning and I just finished my sophomore year. I just returned from studying abroad in the wonderful city of Florence, Italy. I’ve always wanted to study abroad, and I decided on Florence, because it was a place I’d never been to before and it seemed like such a unique, beautiful city. I loved every minute of my time abroad, and I hope you enjoy what I’ve written about Florence and my experiences while there. The two things that everyone wants to know about when coming to Italy is the famous, miraculous FOOD and the amazing SHOPPING. I’ll start with the food. I’m going to make it really simple for you, the three P’s: Pizza, Pasta, and Panini’s. It really is all Italians eat. The one that I personally ate the most of was panini’s. I probably have about three a week, if not more. If you’re going to go anywhere for a panini, go to Pino’s Sandwiches, my absolute favorite place. The next best panini spot is The Oil Shoppe, and if you’re a salad eater then this will be your #1 favorite spot. Both of these spots are really inexpensive and they speak English, so no need to worry. Now, about the infamous pizza. 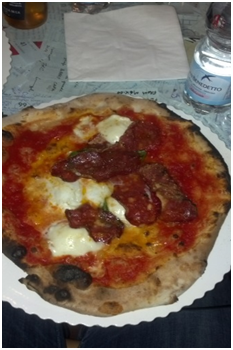 You can probably find good pizza at any restaurant in Florence, but the absolute best place to go is Gusta’s. You’ve never had pizza like this, and you never will again. They’re very inexpensive with a whole personal margharita pizza (you’ll be full) being only €5. Eat it there, which is a very interesting experience, or take it to go and eat like a real Italian on the steps of Santo Spirito. While I don’t have any recommendations for any specific pasta restaurants, no matter what restaurant you end up at there will more than likely be great pasta dishes. One of the greatest secrets of Florence that I had no idea about before coming here is APPERTIVO. What is this, you ask? A wonderful way to eat dinner for cheap. For the price of a drink you get to eat great buffet food all you want, for as long as you want. I would recommend going to either Moyo or Kitsch for this. Another place that is a Godsend for study abroad students in Florence, is The Diner. This is an American diner in Florence that has everything from pancakes to club sandwiches. When I missed home, this was the place I ended up for dinner. Onto the all-important topic of shopping. The best places for shopping in Florence are the markets. The San Lorenzo central market is the best place for leather goods (Florence has the best leather in Italy), such as purses, wallets, jackets, etc. They have jewelry and beautiful scarves, as well as much more. DON’T forget to bargain with them though. The merchants will try to take advantage of you, don’t let them. They’ll act as if you’re hurting their feelings, but you’re not. Don’t be afraid to walk away. At central market there is also an indoor market, with TONS of food for sale. I prefer San Ambrogio market for food though. San Ambrogio is where the locals go and it’s therefore better, cheaper, and less crowded. There is a flea market as well, Ciompi, that is open every day, but is pretty small. You can always find something cool though, and on the last Sunday of every month it gets huge and expands to the surrounding streets. Almost everything you can find at home can be found in Florence. I definitely recommend getting a pair of shoes in Florence, be it sandals or boots (I got both). The leather really is fantastic and rumor has it that it’ll last for years. Keep an eye out for Paige’s next post about her European Travels!